We take horses and ponies on full, part or DIY livery or you can choose from the list of livery services to suit your own needs. 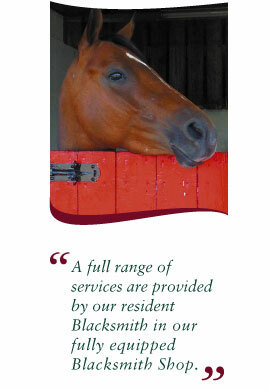 As we live on the premises we offer good security for your animals 24 hours a day. A full range of services are provided by our resident Blacksmith in our fully equipped Blacksmith Shop where shoes can be put on hot or cold. Our livery also includes the use of indoor and outdoor riding facilities (when not in use by Lime Park), horse box parking, winter turnout areas and summer grazing. We sell Badminton Horse Feeds, shavings, hay, straw and haylage to livery and the general public. The yard is laid out in blocks providing either outside or inside accommodation. Stables are available in various sizes to suit individual horses and ponies, and all are fitted with automatic drinkers.